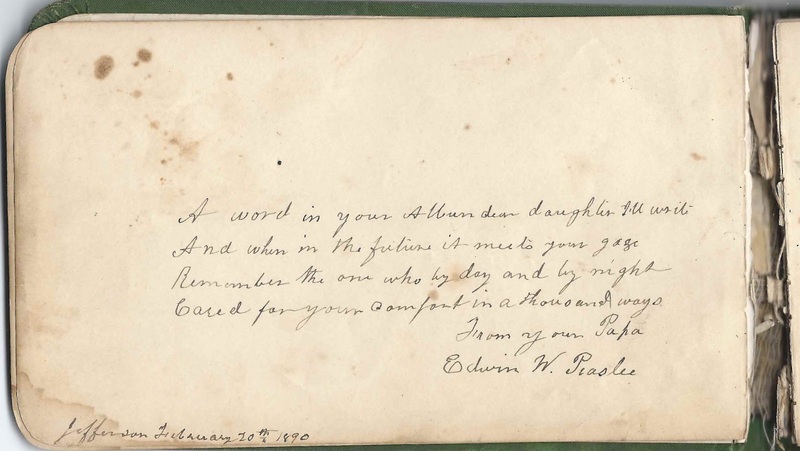 Autograph album that was presented to Addie May Peaslee by her teacher Roswell G. Hilton at South Jefferson, Maine, on January 18, 1890. 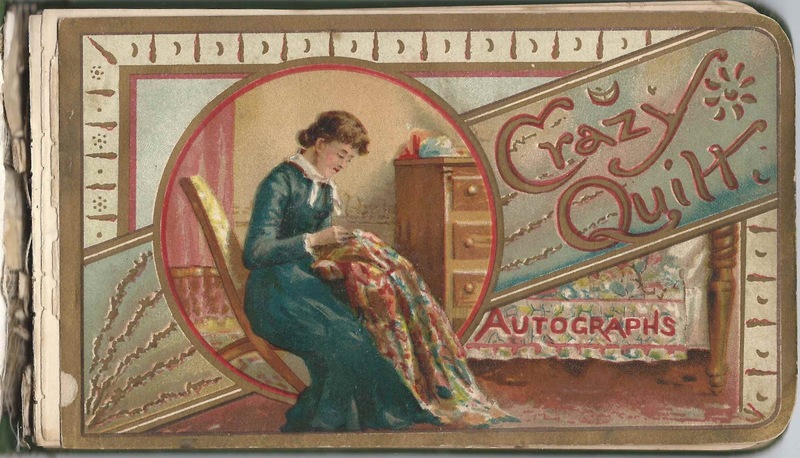 The album is approximately 7" x 4-1/4" and contains the sentiments of 40 of Addie's relatives and friends, as well as several interspersed pages of crazy quilt design like the one that appears on the cover at top. An alphabetical surname list and an alphabetical list of signers, together with any personal information they offered, appear at the end of this post. Addie May Peaslee was born 2 December 1876 at South Jefferson, Maine, the daughter of Edwin W. Peaslee and Nancy A. (Tibbetts) Peaslee. 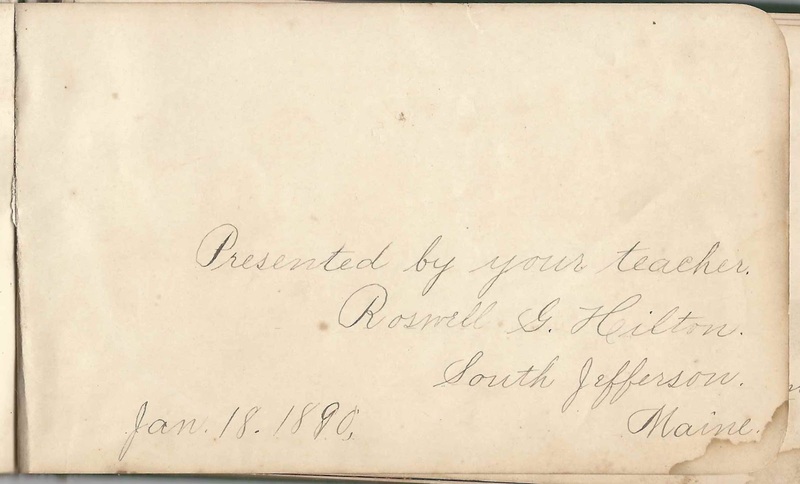 Edwin A. Peaslee signed a page in the album at Jefferson, Maine, on February 20, 1890. 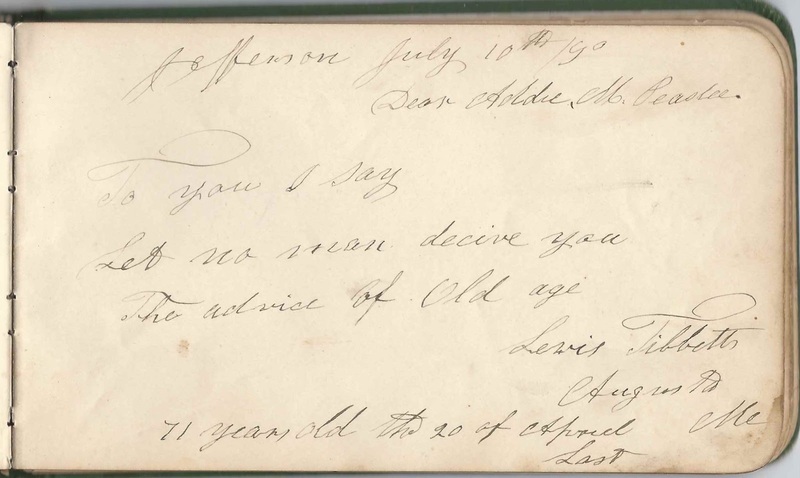 Several members of the Tibbetts family signed pages in the album, including Addie's maternal great uncle, Lewis Tibbetts of Augusta, Maine, who signed a page at Jefferson, Maine, on July 10, 1890, and indicated that he was "71 years old the 20th of April Last". Addie and Everett lived at Jefferson, Maine, and had, I believe, ten children. After Addie's death in 1928, Everett and two of his sons moved to the home of daughter Bertha E. (Jackson) Lincoln at Flagstaff Plantation, Maine, where they were enumerated in the 1930 Census. Everett died that fall. 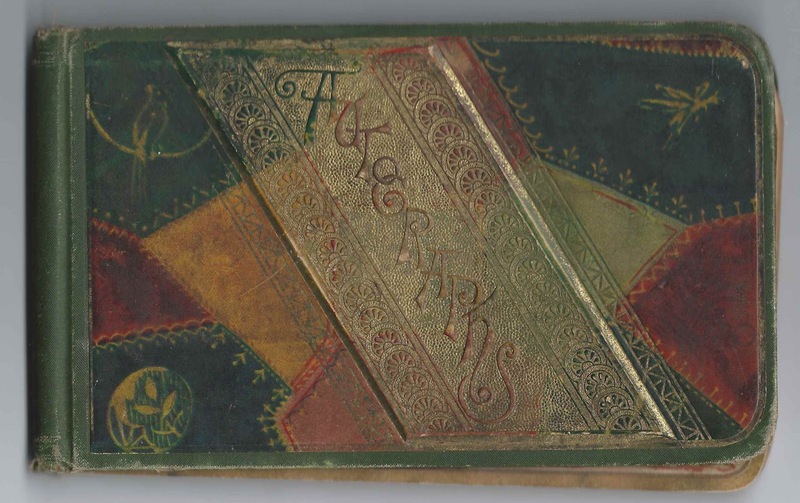 Julia Agnes Callahan of Boston, Massachusetts, signed on August 9, 1895 "native Cork Ireland"
Roswell G. Hilton of South Jefferson, Maine, Addie's teacher, who presented the album to her on Jan. 18, 1890. Rosilla Jackson; paternal grandmother of Addie's husband Everett David Jackson. Frank G. Jackson, signed on February 26, 1890; presumably the uncle of Addie's future husband Everett David Jackson. Mabel G. Jackson of Jefferson, Maine, signed on December 15, 1891. Sister of Addie's future husband Everett David Jackson. Elbert R. Jackson of Jefferson, Maine, signed on December 15, 1897; brother of Addie's husband Everett David Jackson. Nellie Jackson of Westbrook, Maine, signed on September 14, 1893. Addie May Peaslee of Jefferson, Maine; album owner. She married Everett David Jackson during the period this album was circulating to her relatives and friends. Edwin W. Peaslee, signed at Jefferson, Maine, on February 20, 1890; Addie's "Papa"
Ernest M. Skinner of Boston, Massachusetts, signed in 1890; drew a sketch of a girl looking out a window at two birds. Lewis Tibbetts of Augusta, Maine, signed at Jefferson, Maine, on July 10, 1890. "71 years old the 20th of April Last". He was the brother of Addie's maternal grandfather Andrew Tibbetts. F. H. Tibbetts of Silver Springs Park, Florida "Summer residence #75 Morrison St., West Somerville, Massachusetts. During the heated month of August, address Hoyts Island, Belgrade Mills, Me. 3/20-90 A foot of snow on the ground in Boston" Presumably Frederick H. Tibbetts, born about 1841 in Maine. He was Frederick H. Tibbetts, brother of Addie's mother Nancy A. (Tibbetts) Peaslee. Freddie Tibbetts, "Born at #75 Morrison St. Nov. 11, 1876", signed at West Somerville, Massachusetts, on March 23, 1890. Son of Frederick H. Tibbetts, brother of Addie's mother Nancy A. (Tibbetts) Peaslee. Frank L. Tibbetts, signed on March 23, 1890 at West Somerville, Massachusetts. Son of Frederick H. Tibbetts, a brother to Addie's mother Nancy A. (Tibbetts) Peaslee. Clementine E. Tibbetts of West Somerville, Massachusetts, signed on March 19, 1890. Daughter of Frederick H. Tibbetts, a brother to Addie's mother Nancy A. (Tibbetts) Peaslee. 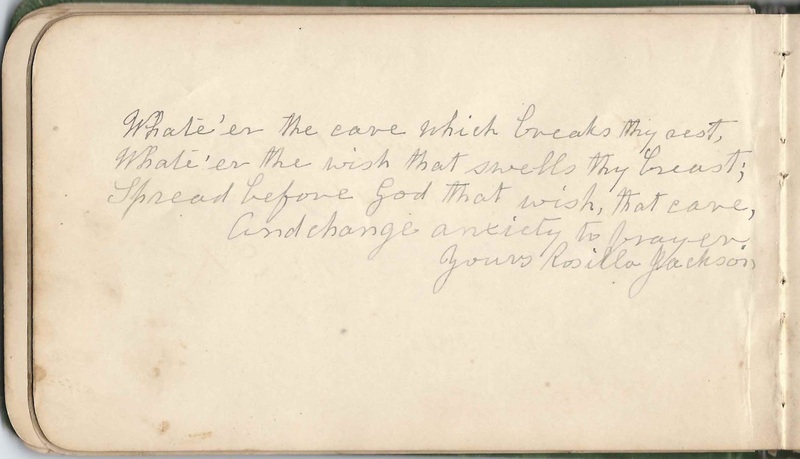 E. C. Whittemore, signed at Damariscotta, Maine, on July 10, 1891. Presumably Rev. Edwin Carey Whittemore, whose wife Ida May (Macomber) Whittemore signed the right facing page. Mrs. E. C. Whittemore of Damariscotta, Maine. She was Ida May (Macomber) Whittemore, whose husband Rev. Edwin Carey Whittemore signed the left facing page. Elizabeth H. Whittemore, signed on July 5, 1891 "Aged 80 years"